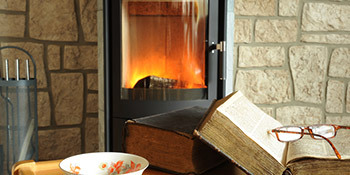 With a wood-powered burner you can supply heat to a solitary room or even connect it to your property’s central heating. Also known as biomass boilers, wood burners convert pellets, chips or logs into heat. With a wood burner for your home’s central heating you can save up to £600 a year, as opposed to using electricity. Although the cost of wood does vary, it is often a much more affordable form of heating than using gas or electricity. In fact, you could see energy reductions up to £600 a year by utilising this heating source. Old gas and electric boilers can fault unexpectedly, leaving you with expensive repair bills. As part of the Government’s efforts to become the ‘greenest ever’ they have created a variety of funds and support for renewable heating. By investing in a wood burner you could benefit from the Renewable Heat Premium Payment (RHPP), a one off grant for the installation. This is worth £950. On top of this, you could also benefit from the Renewable Heat Incentive (RHI) which pays out for every unit of renewable heat produced. Wood burning is known as a carbon neutral form of heat generation. This is because the levels of carbon dioxide emitted when burned, is the amount absorbed over its lifetime. It’s a sustainable form of heating, so long as new plants continue to grow. This is far better for the environment than gas and electric heating, which release emissions and raise a property’s carbon footprint. With a wood burner there are savings to be made of both annual energy bills and carbon emissions. By replacing gas heating you’ll save up to £100 a year, whilst you’ll see a £580 saving by replacing electric. The carbon savings achievable are also substantial, up to 7.5 tonnes when replacing a coal or electric storage system. The below table suggests the possible savings with a three-bedroom semi-detached home. If you’re interested in reducing your energy bills and cutting home carbon emissions, consider a wood burner as a sustainable form of heating. Complete our quick form below and receive up to four FREE quotes from local, vetted and reputable contractors. Project: I have a wood burning stove and the liner has broken up, do you supply replacements? Project: I am looking for a multi fuel wood burning stove for my daughters house in Chirnside (Scottish borders) It has to be contemporary and no more than .And the best price possible. Homes are given an energy rating dependent on just how efficient they are and ratings are shown in the data underneath. This ranges from A, by far the most energy efficient, to G, the least efficient. With a higher rating you're more likely to have less costly energy bills as more heat will probably be retained in the home. It is possible to enhance your home's efficiency with insulation including double glazing, loft lagging or wall cavity insulation. There are many different types of property in the United Kingdom and the data beneath illustrates the type of housing within Uk. Over the country the most popular housing types are typically semi-detached and terraced housing, but detached homes, flats and bungalows are also available. The data beneath provides an indication to the number of properties in Uk which are central heated and non-central heated. Houses are heated by a number of sources which indicate how expensive annual energy bills will be. Types of central heating include gas, electricity, oil, solid fuel and LPG boilers. Changing the way in which your property is heated can easily see you with cheaper bills. The data underneath displays the spread of households heated up by various fuels. Throughout the United Kingdom the most frequent hands down are gas heated properties, followed by electricity and then oil. Biomass boilers are also increasing in popularity, heated by sustainable products including wood pellets or agricultural waste.|Properties in Britain are heated up by a number of fuels, which include gas, electricity, oil, solid fuel and LPG boilers. Each fuel has a varying cost associated with it so you may find yourself with less expensive energy bills by altering how your household is heated. Even solar thermal panels are being considered by many people in order to cut heating bills for the years to come.